How to score in the "Top 10" in Google. 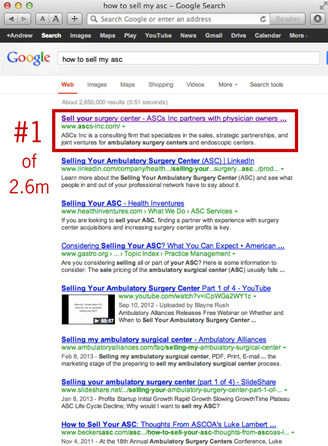 "how to sell my ASC"
Getting your medical practice or ASC to score high on Google for key words, called search engine optimization (SEO), is essential to communicating direct to the consumer for the new medical marketplace. Search engine optimization, or SEO, is the process of creating or affecting the visibility of a website or a web page in a web search engine. By optimzing the way a search engine view your web site or web page it allows you to improve your ranking. When a web search engine finds your web site it does several tasks. First, it reads the content. It determines "keyword density" of words or phrases in the web site. Keyword density is number of times a particular word or phrase is repeated throughout a web page or web site. Words or phrases that are repeated more often have a high keyword density. This is how a search engines know what the content is about. Search engines then assign a "relevancy score" to the content. Search engines know that certain terms should relate to any given keyword. In other words, search engines expect to see certain keywords associated with a specific topic. When the search engine does not find those keywords they assign the content a lower relevance that hurts the SERP, or search engine results page. One of the main benefits that we bring to the table is the ability to get our clients on the first page of Google through the use of various SEO strategies. By doing this, customers will see your name before your competitors and keep you separate from the millions of other web pages competing for the attention of prospective patients. Most internet users do not even click through to the third of fourth page of results, so it is extremely important that your medical practice or ASC shows up on the first page. Our sites score high because they have legitimate educational content about various specialties and score high in relevancy. This content is drafted by writers who use phrases and text strings that respond to consumer key word queries. This approach is MORE EFFECTIVE than having a physician waste valuable time drafting text that is written in a style more for other clinicians rather than the consumer. Medingenuity frees the physician from the time-consuming and expensive task of trying to educate prospective and current patients. Copyright © 2017 • Medingenuity, LLC • Healthcare marketing and educational web sites for physicians and healthcare companies across Texas, Oklahoma, New Mexico, Colorado, Arkansas and Louisiana.